For most people travelling in Japan, besides the rich historical culture, food tourism is likely to be another highlight for the visitors. Despite the fact that we were surrounded with amazing restaurants in the city, we made sure we reserved one night to enjoy a true local experience by visiting a grocery store & cooked our meal at our Air BnB. We felt that by grocery shopping, we get to see the types of ingredients that the Japanese people like to shop and cook at home. With our Japan Rail (JR passes), we were able to conveniently hop on and off the JR line. On our way home after a long day of exploring, we decided to check out a local 24-hour grocery store, Hanasama, a name that is known for its quality, selection and location. The chain originally were meant to sell supplies to local restaurants (B2B businesses) but now have expanded to also sell to the public. 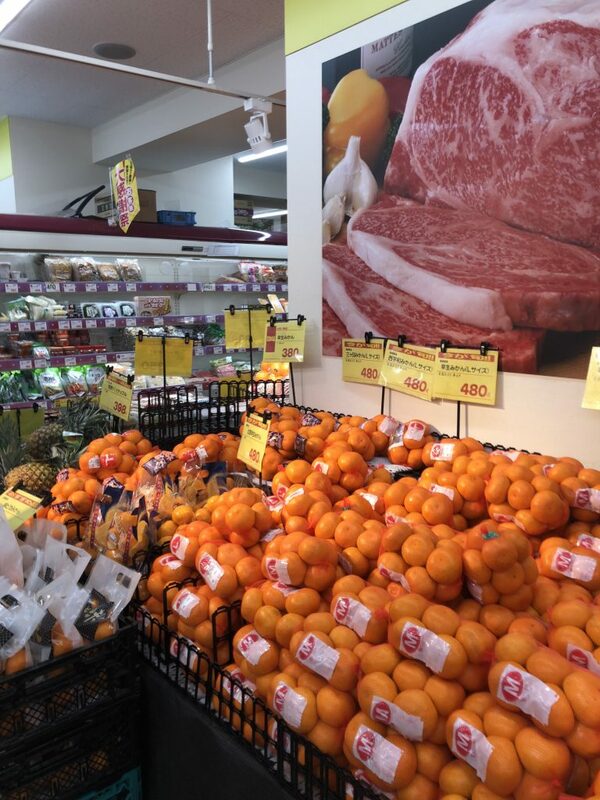 It offers a wide selection of fresh food in larger portion than your typical family grocer. 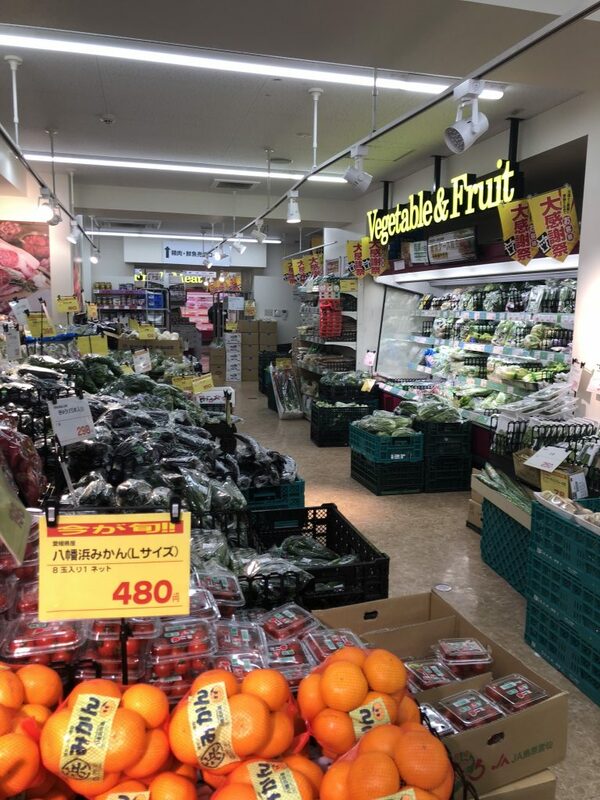 Store square footage was a bit larger than other grocery market you will find around Tokyo. 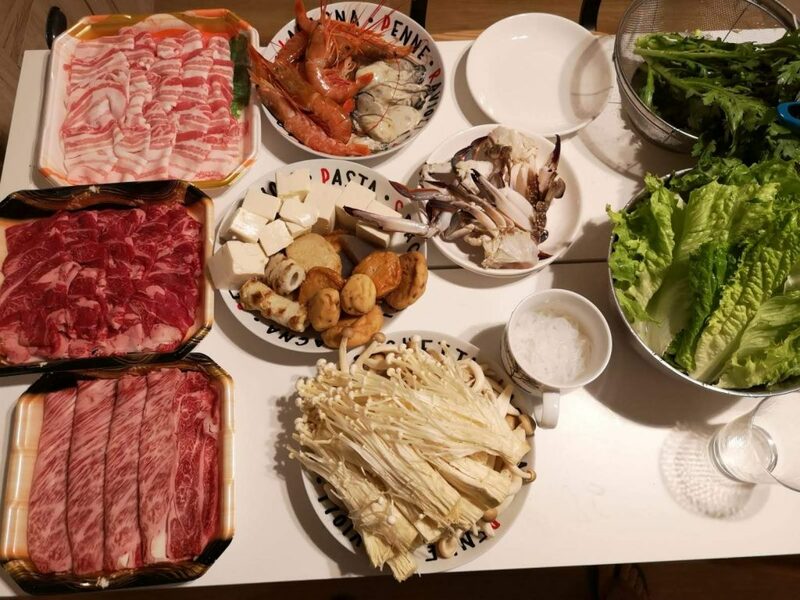 We were destined to find the freshest ingredients for our homemade “Shabu Shabu”, a Japanese hot pot featuring thinly sliced meat and vegetables along with a dipping sauce. Upon walking into most supermarkets, you can expect to be greeted by a clean storefront with fresh local produce. If anyone is worried about language barrier, please don’t. The freshness and wholesomeness of the food speaks for themselves. All of the produce was neatly placed together. Never will you find a wilted leaf. For our vegetable options, we picked up lettuce, enoki, shimeji mushrooms and tofu. 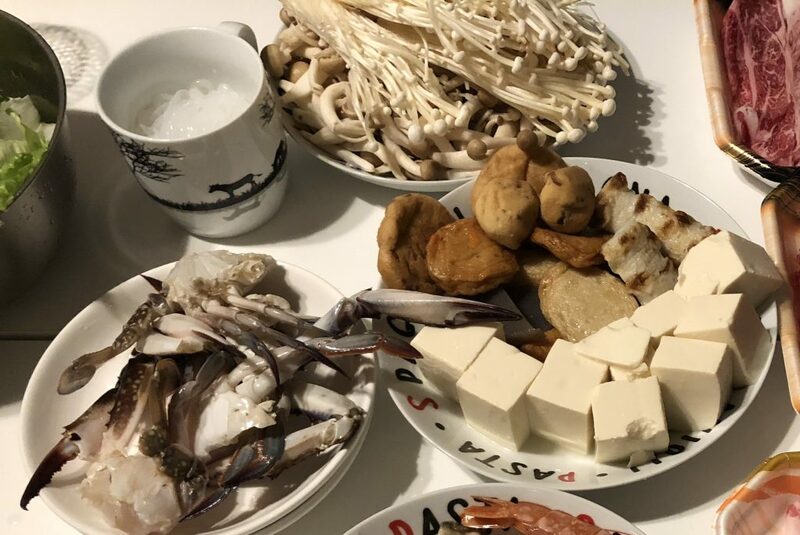 Most of you are likely familiar with enokis, the small cap mushrooms, but Shimeji has grown international popularity in recent years. They are the third popular mushrooms in Japan after shiitake and enoki. They are now available in most Asian super markets in Canada. They often come in white or crackled brown caps. They are unique for their sweet nutty, buttery flavor and smooth crunchy texture yet mild mushroom earthy note. It makes a perfect pairing with shabu shabu as the rich flavourful broth add more complexity to the mushroom. Another “must mention” item was the soft silky tofu. The soy flavor was so clean and refreshing. As you may know, ingredients in tofu are fairly simple: soybean, water, and a coagulant (magnesium chloride or calcium sulfate). Soybean is the most consumed oil seed by Japanese. Almost Japan’s entire domestically grown soybean is non-GMO and exclusively used for local food production. It also makes Japan one of the leading countries in importing high quality non-GMO soybeans. Being in Japan, of course we had to pick up Waygu beef for our Shabu Shabu. 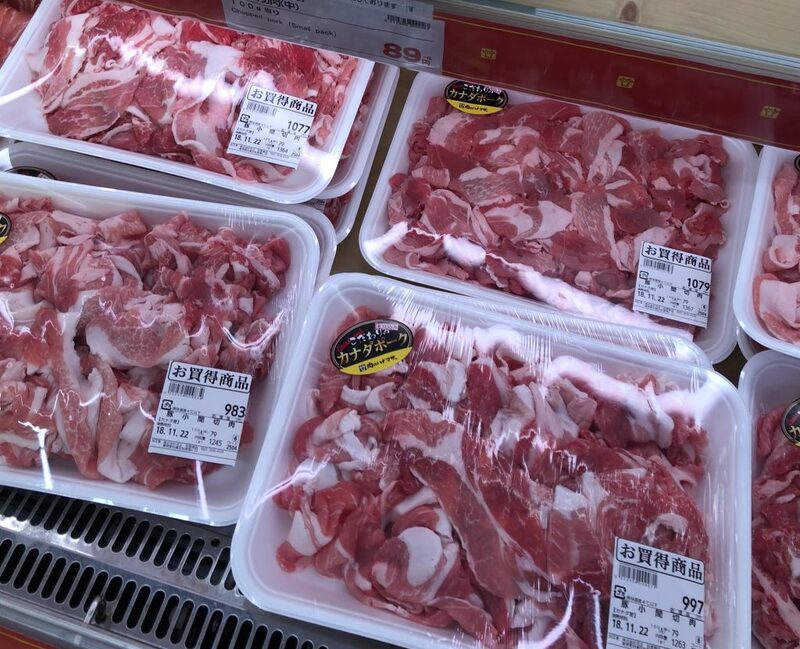 While we see Waygu as a gourmet and premium meat option, it was surprising to see Waygu beef available at all local supermarkets. Being naturally higher in fat with their genetic makeup, it is the perfect addition to our hot pot. The marbling characteristic in the meat is phenomenal. The thinly sliced meat melts in your mouth like butter and balanced by the savoury soup base. Price was considerably fair given that Waygu beef is probably two to three times to price in Canada. It was definitely one of our favourite purchases. For seafood, we chose some beautiful shrimps, a side of crab and oysters. While the shrimps were cooked and labelled as sashimi grade, we chose to have it in our hot pot. Overall, we were highly satisfied with our discoveries. While we had an exhausting day discovering Tokyo, we were delighted by our local supermarket experience. We highly recommend anyone staying in Japan to choose an accommodation with a small kitchenette. It is always a nice treat to have the option to kick back and enjoy a home cooked meal. Back at home, we are quite used to going grocery shopping in our car. We were initially a bit concern how difficult it would be to bring all this grocery back. But after experiencing our first few days with the JR pass, it really shows how convenient it is to have a well established transit system. The unlimited riding allowed us to explore at ease and not have to worry how much we have already spent in transit. Having the JR pass gave us an opportunity to explore everywhere. This includes not only tourist highlights but also local neighbourhood which really added a special touch to our Japan experience. Want to learn the benefits of the Japan Rail Pass (JR Pass) and where & how to purchase the JR Pass? Click my MoVernie BLOG to find out. Want to know more about my Japan trip experience and adventures during my visit in Tokyo, Japan? 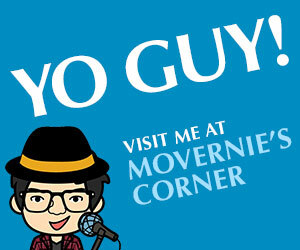 Follow my journey on Instagram (@RealMoVernie) and Twitter (@MoVernie). 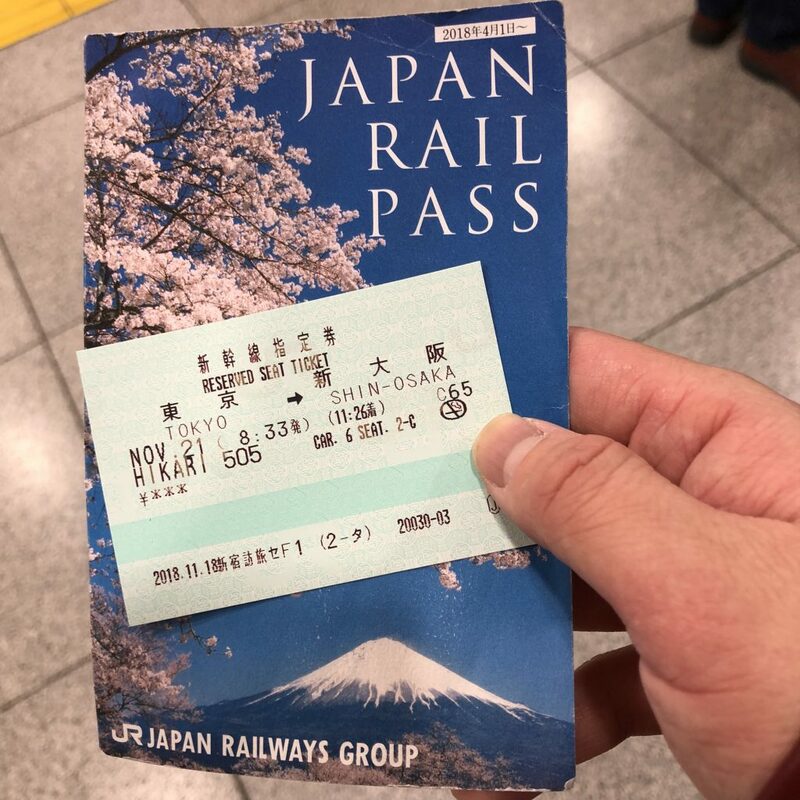 For this Japan trip, our team used the Japan Rail Pass as our official mode of transportation, which these JR passes were provided by Japan National Tourism Organization (courtesy from the assistance from both Tokyo & Toronto branch locations). However, as always, the opinions expressed in this post are entirely my own. I would also like to give a special thanks to Air Canada for providing the return Signature Class flights from Toronto, Canada to Tokyo, Japan. Without such hospitality and assistance by Air Canada, this Japan trip would not have been possible.